Here are just a few examples of wildflowers from the family Fabaceae. There are very many more on this website, where you can have the species arranged in their families. The Pea family is very well represented throughout the UK and Europe - they are particularly plentiful in the Mediterranean region. 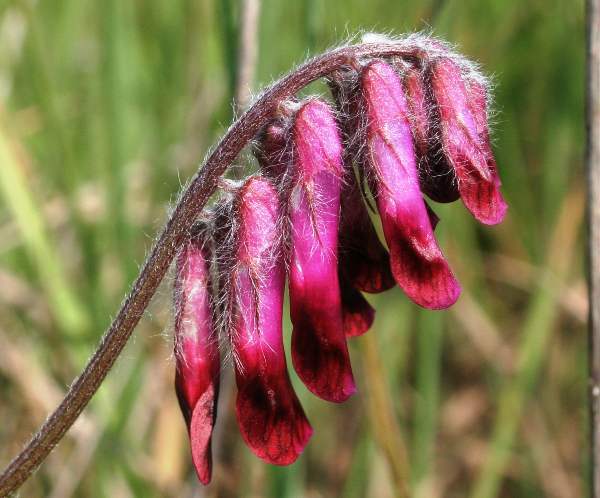 The flowers have five petals, two of which are joined at the keel; another common characteristic is the elongated seed pods of flowers of this family. Below: Vicia benghalensis - one of the colourful members of the Fabaceae family found in the Mediterranean region. The Fabacea (formerly known as Leguminoseae) include various vetches, clovers and medicks; bushes such as gorse and broom; as well as Laburnum, an introduced (to Britain) deciduous tree. Most members of this plant family bloom in summer.